Compressible and flexible, SNS tapes can conform to irregular surfaces. SNS products are often referred to as “instant gasket” — simply unwind material off the roll, strip the release liner and stick into place. Saint-Gobain Performance Plastics offers both high and low temperature silicone adhesive and aggressive, strong anchorage acrylic pressure-sensitive adhesive on one side. SNS products can be supplied with closed cell sponge backing (SNS 100S, SNS 200A), fibreglass-reinforced closed cell sponge (SNS 300AR), soft and thin solid silicone (SNS 440S, SNS 440A) or flame retardant foam backing (SNS 512AF). 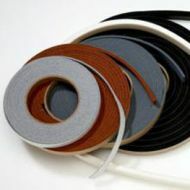 For extreme temperature applications, Strip-N-Stick silicone rubber tapes outperform all other elastomer tapes in service life, weatherability, compression set resistance and electrical resistivity. These pressure-sensitive Strip-N-Stick tapes are available in a variety of widths and thicknesses for use in gasketing, cushioning, thermal insulation and vibration dampening applications. Other uses include noise reduction, clamping of hot parts and electrolysis reduction between dissimilar metals.